The Omega Caliber 2500 was developed by Omega in the 1990s. In 1993, Omega purchased the patent for the Co-Axial escapement from English master watchmaker and inventor George Daniels. The Co-Axial Escapement was the first practical new mechanical watch escapement invented for mass market in 250 years. Omega began work to fit the Co-Axial Escapement to their Cal. 1120 movement. The 1120 was basically a decorated version of the reliable Eta 2892-A2 movement. Omega spent the next six years developing and improving the movement to fit and utilize the larger escapement. In 1999 Omega released their first watches to the public with the Omega Cal. 2500. 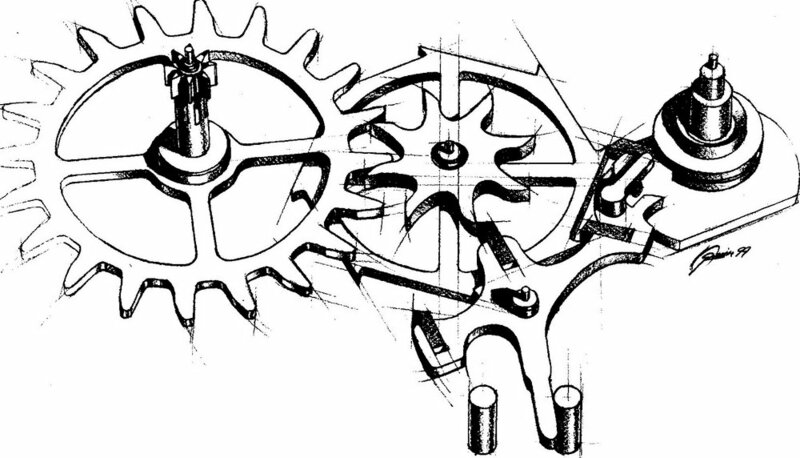 The Co-Axial escapement has two escape wheels mounted together to release the torque from the main spring. Because there are two wheels working in conjunction with added jewels, there is less friction. No longer are there two jewels sliding along the teeth of a single wheel, but now are three that just catch the edge of the teeth on two wheels. This means less friction in the escapement, thus, longer periods between services. Omega has put together a short informative video and is worth your attention to better understand this innovation. In 2007, Omega launched the De Ville Hour Vision Chronometer with the Cal. 8500. All 202 components were designed and produced by the company’s workshops. The Omega 8500 Caliber family was developed in-house by Omega around a revised Co-Axial escapement to fully optimize its potential. The Co-Axial escapement organ is 13% larger and more efficient in the larger space availed to it. It gets its power from twin mainspring barrels. The barrels are DLC (Diamond-like carbon) coated inside to reduce friction and have been tested to simulate over 10 years of use with little wear effect to the DLC. Sixty manual rotations of the crown fully winds both mainsprings. The “hand-wound” barrel without slip clutch is wound first, then the “automatic” barrel with slip clutch. The hand wound barrel with slightly more torque unwinds first until the automatic barrel quickly jumps in to jointly power the escapement. The bi-directional winding rotor has been redesigned to make it so efficient that it winds with the slightest wrist motion and is almost inaudible. The movement is decorated with a beautiful “Cotes de Geneve en Arabesque”. Other improvements include: 14 leaf meshing pinion versus 8 leaf on the 2500, Nivarox Anachon balance Spring, Zircon Oxide rotor pivot jewels, improved Nivachoc shock absorber, and massive transverse balance bridge. Since 2011 the 8500/8501 have been equipped with the more stable silicon Si14 balance springs. The older versions will be gradually upgraded to Si14 balance springs at service. The 8501 is a 8500 with 18k rose winding rotor and balance bridge. Omega has achieved its honorable mission of developing a family of calibers that are extremely reliable, have highly accurate rates and have longer periods of time between needed services. With the 8500 calibers, Omega developed everything around the Co-Axial escapement instead of making the Co-Axial work with existing movements. 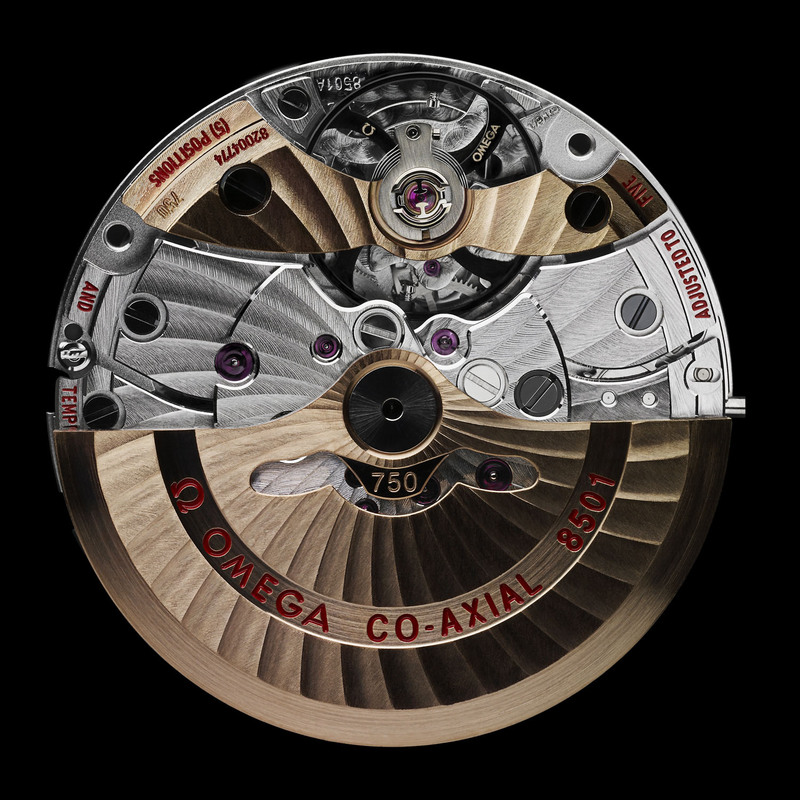 Omega first designed the optimal Co-Axial and only then the rest of the movement. The result of this is that the Co-Axial escapement in the 8500, besides from also being larger, is actually different from the previous Co-Axials in a variety of ways. The free-sprung balance is far, far nearer to the mathematical ideal as it does not have a regulator interfering with the spring. This helps with all forms of stability, including, of course, positional stability. The escapement is in contact with the balance for a far shorter period allowing more of the balance’s swing to be free of interference, once again far closer to the mathematical ideal. (this, of course, can also reduce the effect of position). Wear on the contact surfaces of the escapement has been almost entirely eliminated. In an admirable show of honesty, Mr. Monachon also cautioned us that although the calibre 8500/8501 are completely designed and developed within OMEGA Granges, it is dangerous to call the movement completely in-house manufactured. Without the help and assistant of Comadur, Nivarox, ETA and Frederick Piguet – all within the Swatch Group, the success of this calibre and the Deville Hour Vision model would not have been possible. The objective is to manufacture the complete movement and watch within OMEGA premises but at the moment, only assembly is done within the OMEGA compound. Bernard Watch usually has multiple watches with the Omega Caliber 8500 and Omega Caliber 2500 in stock. Hi Nicholas. If you consider the fact that it’s all SWATCH Group made, then yes. However, Omega itself does not consider their movements to be 100% in-house as that would entail OMEGA is doing it all without the help of other SWATCH Group brothers and sisters. Hi Tom. I think you’re good. 🙂 Just about all of the Planet Ocean models we’ve bought and sold have a SOLID case back. This should indicate your watch has an Omega 2500 caliber. The newer models with the 8500 sport the display back. We did not see a Planet Ocean with a display back until November 2013. So basically, the 2500 is a copy of the ETA movement or it is ETC with Co-axle and the 8500 is purely Omega design? I’m trying to purchase my first Omega.. I want it to be a good purchase…. some one offered me a 29005091 with the 2500 movement and I was curious why the newer 8500 had the crystal case back (which I like). Are there any downfalls to the 2500 movement? Is it “respectable”? The 2500 is a very good movement. The 8500 is an excellent movement. I feel Omega’s use of the display back on the newer models with 8500 (or 9300 chrono) is them rightfully being proud of it and wanting to show it off! The 2500 began as an ETA 2892, so I would not use the word “copy”, but some people might. It is/was a 2892, that’s been improved. Besides adding the co-axial escapement, Omega made other improvements to the 2500. I’m considering buying an Omega Seamaster. It says it has a caliber 2500. Does the Seamaster use other calibers? Is the 2500 the best caliber the Seamaster comes in? Hello Ned. The Omega Calibre 2500 is a very good movement with proven reliability. Most newer Seamaster watches use an 8500 (or a variety of it) which is considered by most to be a better movement. That said, you’ll have to pay up to get a newer one with the latest movement. The 2500 models offer a better value at this time. My post describes in more detail the different Seamaster models and the movements you’ll find in them from 1994 to current. Is the 2500 considered an in-house movement? The 2500 is a modified ETA 2892-2 with main mod being the addition of the Co-Axial escapement. Omega does not make a 100% in-house movement at this time. Hi Cory, your above article is very informative. I am looking to purchase an Omega and currently considering two options, the Speedmaster Day-Date 3220.50.00 and the Seamaster Pro 2225.80.00. Although i am not much into water sports, i need a sturdy everyday watch which can go on for a long time. The Speedmaster fits well on my hand, but i am considering whether the Seamaster offers better durability and resale. Which of these two is the better option? Also, is it a good idea to invest in a non-coaxial model at this time, and are these two movements (caliber 1164 and 3606) reliable? Appreciate your inputs. Sorry for the delayed reply GPro. The Omega 1164 and 3606 are both based on the Valjoux 7750 which is a great movement. I wouldn’t rank the 1164 or 3606 as being more reliable than the other. The Seamaster line is indeed more sturdy, but the Speedmaster is no slouch. I mean, a Speedmaster went to the moon! In general, the Seamaster line is easier to resell, but the 3220.50 is a classic style and we’ve had good luck selling that model in the past. For my skinny wrist the 2225.80 is too thick and I’d prefer the 3220.50. Where does the 8508 fit into this picture? The 8508 is the highly anti-magnetic version of the 8500. Hayek has said Omega plans to eventually incorporate anti-magnetic parts from the 8508 into ALL of their watches. With that in mind, and a search for Omega 8508 mainly bringing up articles from January 2013.. I feel the 8508 may end up being more of a short production or prototype type of movement and watches with it could end up being a good watch to collect/invest in if bought right. It (the 8508 specifically) may never appear in any watches for sale to the public. I was looking through the duty-free stores in Panama City this week and saw an 8508 anti-magnetic watch on sale! So, they are out there in limited numbers for the public. We’re clearly fans of Omega. Bell & Ross also makes a good watch and uses quality components. When it comes to the movements, Omega is definitely in front of Bell & Ross. The Omega 8500 caliber is the newest and best of the movements you mentioned. As this article discusses, the Omega 2500 started as an ETA 2892 and was primarily fitted with the improved Co-Axial escapement. Omega is the only brand with that movement component. ETA 2892 is a fine movement, but it is from the 1970s. Bell & Ross is not known for their mechanical innovations. Also, it can be unclear if their current models are even using ETA or movements from Selita. What is your opinion of the 2500D movement versus the 8500 movement (say 8507)? Is the 2500D significantly better than other 2500 movements?, and if so how? You said “The 2500 is a very good movement. The 8500 is an excellent movement.”. Where does 2500D fit in this spectrum between very good and excellent? The 2500D has married the co-axial escapement to the movement. The 2500D escapement is very similar to the ones used in the 8500 series. There’s a lot of discussion at Watch-U-Seek about the topic. I’m not a watch-maker, but the 2500D is an improvement over the 2500C… but the 8500 is better. From what I can tell, the 8507 is just an 8500 with special Bond 007 decorations. 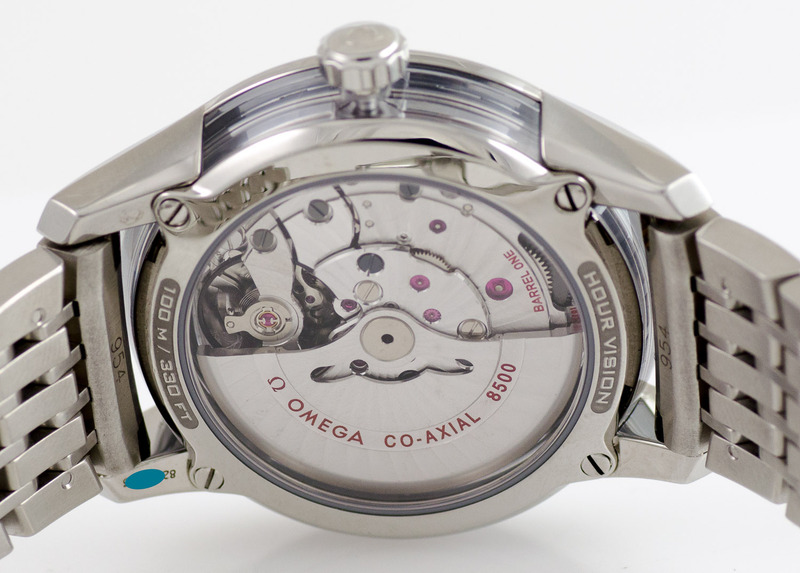 We have only seen the 8507 on the Omega Skyfall limited edition model. I doubt the 8507 has an performance improvements over the 8500. I guess another way of asking might be : would you prefer the 2500 D or the 8500 considering the increase in weight and size the 8500 brings? Does the ‘betterness’ of the 8500 over 2500 D justify the extra weight in your opinion. The 2500 had some controversy (I believe the A and B especially). Do you have full confidence in the 2500D or would you rather take the 8500 and stay clear of the controversy? If on a scale of 1 to 10 if 8500 is say 10 then where might you place the 2500 A and 2500 D? The 2500A and 2500B did have some problems, but the C version fixed those issues (around 2004). At this point I would GUESS/ASSUME (so take that with grain of sale) less than 5% of 2500 calibers are an A or B. Maybe even less than 3%! I believe those original movements were only in certain Aqua Terra and Planet Ocean models. By the time Omega was putting the 2500 in the Professional (now Diver) version they were all C (and now D). I have never heard anyone mention the weight of the 8500. The weight of the case and band will overpower whatever minor weight differences there are. I’d prefer not to rate the movements on a scale. I have full confidence in the 2500C, 2500D, and 8500. Even the 2500A/2500B can be upgraded to a C, so that’s not even a big concern… but if you are going to assume having to do that upgrade on the A/B the price you pay for the watch should have that in mind. Hi Tom. I am not familiar with that version of the Deville. A quick Google lead me to one for $2500 Euro at Chrono24 which I assume is the one you are talking about. Based on the photos, that watch does have a 2500 Co-Axial. We have never seen a rectangle DeVille with a 2500, but the price ($2836 USD) does seem a bit on the high side, but not expensive, reasonable. If we were posting the watch for sale we would do an additional 10-15 minutes research. Seamasters sell for about that and are much more in demand (even though there are likely over a million more of them in circulation opposed to just 111. We’ve found limited editions typically don’t add any value and often make them harder to sell. If the 8500 is not up to Master Co-axial anti-magnetic standards, how is it that the 8500 can have a display back? Apparently there is no protective case around the movement to protect against magnetism. One of Omega’s big goals with going anti-magnetic is to avoid having to use a case/cage to shield the watch. They are making the parts anti-magnetic. Even the 8508 has a display back. Do you know what level of magnetic insulation does the previous Calibre 8500 (Co-Axial) have? The new Calibre 8500 (Master Co-Axial) has a resistance of 15,000 gauss using a silicon balance spring. To my knowledge the Co-Axial already uses a silicon balance spring so I am wondering if there is a major difference. I just prefer that the date window has a chrome lining in the Co-Axial. If there is not much of a difference I would just get the Co-Axial. Appreciate your thoughts. I have not seen any data on how anti-magnetic the original 8500 is. The Si14 was introduced in 2008 and can be found in many of their calibers. With the new Master versions of the movement, Omega makes use of non-ferrous materials. For instance, they replaced the steel plates with non-magnetic plates and staffs and pivots made of Nivigauss.. In general, the whole concept is to replace any magnetic part with ones that are not! People have been walking around with watches that can be magnetized for a century. Most people do not interact with magnets that disturb their watches. The strongest magnet the average person comes in contact with is on the refrigerator/freezer door… Or an iPad cover. Anyone know how many jewels are contained in the first of the Omega Speedmaster Co-Axial watch movements, the 9300? The Omega 9300 has 54 jewels. Hello Wayne. The 8520 is a smaller version of the 8500. It is used in their smaller watches like the 37.5 MM 232.30.38.20.01.001 I assume you have and ladies automatic models. How do you compare the omega PO vs Rolex sub? I like the De Ville Prestige but it has a solid back and a 2500, will they ever make that model (or one that looks like it) with a 8500 an display back? Danny, It looks like Omega has released several Deville Trésor models with 8511 movements (not 8500) and display backs. – P.J. Please be informed that we do not retrofit earlier versions of calibre 8500A with a silicon balance spring. Such an upgrade will not be possible in the future either. I had a Planet Ocean 8500 , but i sold it because thickness and looks more like a tool watch, then i found a Planet 2500D, and is by far more exact than 8500 movement, also the design is more beautiful and more comfortable in my opinion, 2500D is extremely improved movement. How many jewels in the master co-axial 8500 (231.10.42.21.03.003)? The Omega cal. 8500 uses 39 jewels. I recently purchased the new Speedmaster Co-Axial Chrono caliber 9300…very beautiful watch. However I noticed that it makes a crackly sound when I shake it side to side, like a baby rattle? I also have a PO 8500 in the 45.5MM which is fine, is this something I should be concerned about? It seems to be when the rotor swivels back and forth? The Omega 9300 is not a quiet movement. I just checked out 2 in our inventory and to me, it’s a louder than average sound of a rotor rotating, and fine. Chronographs are often louder than non-chrono watches. I’ve held over 10,000 watches over 20 years, so what I hear as a normal rotor sound, someone new to watches might call a baby rattle… But if I heard a watch that I would say sounds like a baby rattle, then I’d think there might be some screws or other part loose. We can not diagnose remotely and we do not have a watch maker on staff. If you have not already, you should fine a local expert to assist you in person.